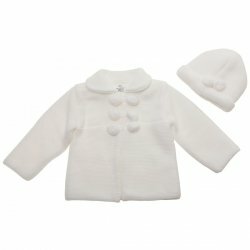 Thick, soft and warm baby knitted coat with hat. Decorated with pom-pom balls. Baby blue colour. Make in Portugal. 100% quality acrylic. For both boys and girls. This coat is small cut. Please purchase one size up. e.g. if you normally buy size 12 months then please buy size 18 months.